Summers are here screaming bright colors and pretty lipsticks. 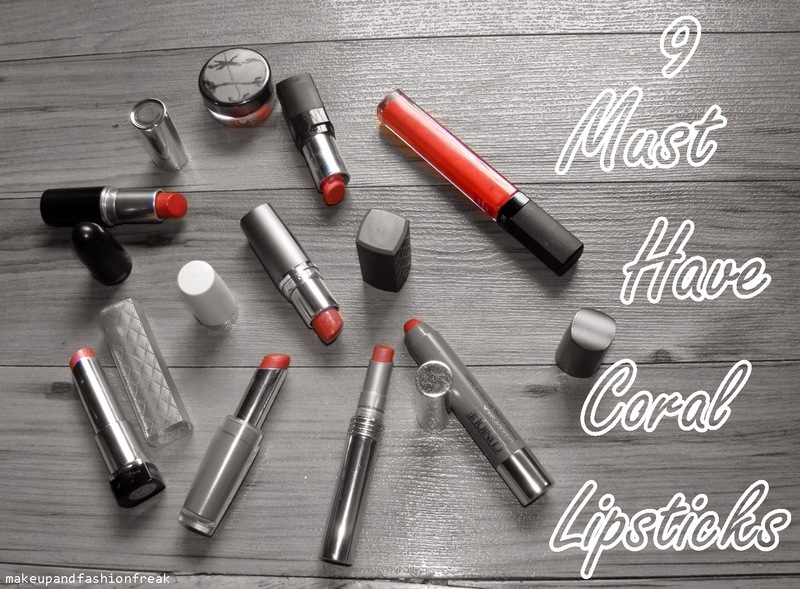 So, here I am with 9 coral lipsticks you should totally own. I had taken these pictures last year ( I KNOW :P ) and since then I have added many more in my stash because I am a total sucker for coral lipsticks. I will surely share them with you some other time. Coming back to the post, I have swatched and reviewed most of the lipsticks listed below. All of them are my favourite and I love wearing all of them. I think most of you must be having this lipstick already. But the ones who does not own it, my advice to you is, GO GET IT NOW. Again, my most worn lipstick. I love love love it. I will be repurchasing it forever. Now thats a funny name, if you know what I mean. lol. Pretty color with very fine gold shimmer. I wont say its must have but I quite like it. I dont know if this one is still available. I find the packaging really cute and carry it in my bag most of the time. The color is bit on the orange side.Also, the swatch looks pigmented but it looks sheer on lips. Smells like vanilla. I like applying it during the daytime when I am not in the mood of wearing a lipstick. Hope you enjoyed the post. Do let me know what is your summer must have lipstick.